Home » Quilting » Another finished quilt! In my last post I mentioned how my sewing machine was going in for a service…although I felt a bit jittery at the idea of not having my machine I had a list of things that I wanted to sort out (mainly re-organise my sewing room) and near-completed projects that I wanted to finish. Sadly, I was wildly over-ambitious both in terms of the size of my list and the time:inclination ratio. I did make a start though – moving slightly closer to my goal of being able to fit all my craft books on my desk! 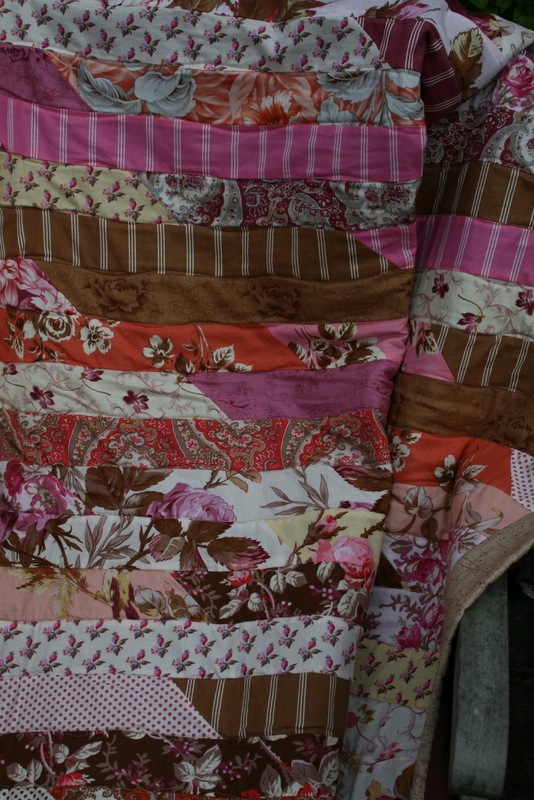 One of the projects I really wanted to finish was my jelly roll quilt which I started way back in April. Eventually, I did rip out a couple of the seams and reposition the rows. It wasn’t entirely necessary, but did reduce some of the pooling and makes me feel happier with the quilt. I added a border around the outside of the quilt to make it a bit bigger. It was backed with some brown fleece before quilting with wavy lines down each row of the blanket. I had my age old problem of not using enough pins and having some puckering but this was quickly rectified, and having done two quilts now I am learning that Pins Are the Key! In the second photo (taken in May!) you can see where I’ve pinned the binding before I started to slowly sew it in place. But it took me a-g-e-s and eventually got interrupted by a quilt order and holidays and then sat neglected in the corner. So this weekend – being one of the hottest the year and all that! – felt like the ideal time to finish this off. The binding was completed last night and I have to say that having this draped over my lap whilst it was so hot was not my best idea although it did give Mr f&f a laugh! All the ends were woven in today and it’s even been washed and dried already! The colours and patterns still make my heart sing. I love that they dance on the retro/modern line. In case some of you are wondering why I went for a beige/brown border and backing it was mainly because Mr f&f was not too keen about having something “pink and flowery” in the living room which is where I wanted to put it so I tried to subdue the girliness just a little! What I really like with this quilt is how when it’s all scrunched up in a chair it has real character and you get a glimpse of all the different fabrics that were used. I particularly love all the paisleys. I’m really pleased with it and will probably do another one at some point as they’re quick and effective to make: an ideal present! And I’d definitely recommend it to someone thinking of having a go at making a quilt top – it’s a great introduction to quilting. For now, though, I think I’ll have to fold my blanket and tidy it away until the weather turns a bit cooler – although I’m already looking forward to snuggling underneath it! I hope you’ve all been enjoying the sunshine and had a lovely weekend?! Today’s sky ● blue with clouds but very hot! Previous Post Trying new things!